Mark Pilgrim's Dive Into Python 3 is a hands-on guide to Python 3 (the latest version of the Python language) and its differences from Python 2. As in the original book, Dive Into Python, each chapter starts with a real, complete code sample, proceeds to pick it apart and explain the pieces, and then puts it all back together in a summary at the end. Dive Into Python 3 is a Python book for experienced programmers. Whether you're an experienced programmer looking to get into Python 3 or a grizzled Python veteran who remembers the days when you had to import the string module, Dive Into Python 3 is your 'desert island' Python 3 book. If you've never programmed before, Python 3 is an excellent language to learn modern programming techniques. But this book should not be your starting point. Get "How to Think Like a Computer Scientist: Learning with Python" by Allen Downey, Jeffrey Elkner, Chris Meyers and learn the basics. Then dive into this book. 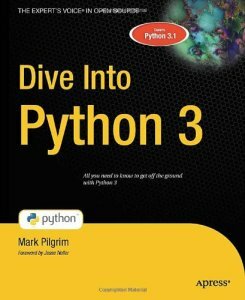 Dive Into PYTHON 3 was written by Mark Pilgram, and this edition is distributed under the terms of the Creative Commons Attribution Share-Alike License 3.0. * Money raised from the sale of this book supports the development of free software and documentation. About the Author: By day, Mark Pilgrim is a developer advocate for open source and open standards. By night, he is a husband and father who lives in North Carolina with his wife, his two sons, and his big slobbery dog. He spends his copious free time sunbathing, skydiving, and making up autobiographical information. By day, Mark Pilgrim is a developer advocate for open source and open standards. By night, he is a husband and father who lives in North Carolina with his wife, his two sons, and his big slobbery dog. He spends his copious free time sunbathing, skydiving, and making up autobiographical information.